Paint Store :: Shop by Brand :: Wooster Brush :: WOOSTER R017 SHERLOCK ROLLER FRAME SIZE:7" PACK:6 PCS. World’s best-selling professional frame! 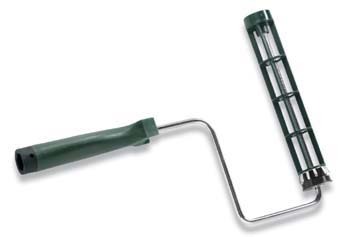 Quick-release spring prevents the roller from slipping, yet allows easy, one-rap removal. Fiberglass-reinforced cage keeps the roller round and withstands the force of cover removal. Smooth-rolling internal bearings eliminate shank wear that causes graying and streaking. Chrome-plated 5/16-inch shank with popular 90-degree angle. Comfortable polypropylene grip with reinforced threads for all extension poles, including the no-twist Wooster Sherlock GT®. Overall 15-inch length. UGL 13812 ZAR 138 SPANISH OAK WOOD STAIN SIZE:QUART. WATCO 65931 MEDIUM WALNUT DANISH OIL SIZE:1 GALLON.